I've finally finished the move to my new home. It took a little longer than expected because of some fine print in the lease at my old place and an accident while packing that saw me being taken to hospital in an ambulance to have some stitches put in my arm. 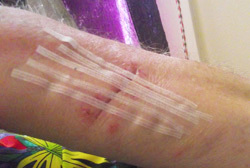 (The picture shows the hole after the stitches were taken out.) Now all I have to do is unpack all these boxes and bags. This was sent to me using the email link that appears at the bottom of pages in this site, so it isn't spam. I suspect that the writer missed the point of whatever page he was looking at. Dear Servant of God, We are glad for your faith and truth which you have posted on your website which indicate that God has inspired you more about the coming Kingdom. We praise be to God because He has a purpose that is why we have been directed to contact you to join our local congregation as our spiritual leader who can inspire us more because our prayer is that we need to grow in the word so that even us can spread the word before the second coming of Jesus Christ. He sent the first twelve followers because of what He had done; having risen from the death he was now back in his place as the son of God with all authority over life and death. it is important that people to know that he has that authority. Australia's National Health and Medical Research Council has just wasted a rumoured $800,000 to produce a report telling us what all honest people have always known - homeopathy is useless. I'll be writing about this for Australasian Science magazine so I'll just put the media release here for the time being. More detailed reports can be found by clicking on the images below. And are the homeopaths whining and complaining? Well, of course they are, but there is a reason I used the word "honest" above. 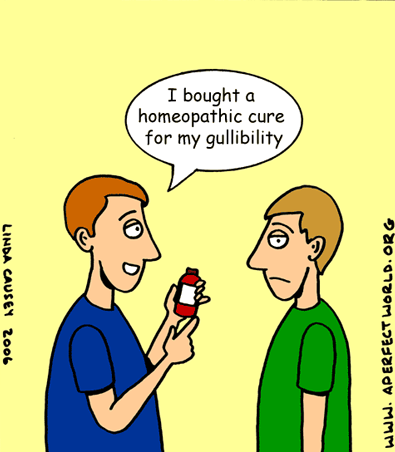 They know, they really know, that homeopathy is a scam of quintessential purity. It has never worked. It does not work now. It will never work in the future. Its sole purpose is to move money into the pockets of quacks. The National Health and Medical Research Council today released a statement concluding that there is no good quality evidence to support the claim that homeopathy is effective in treating health conditions. Its release follows a thorough review of the evidence, conducted as part of NHMRC's responsibility to provide advice and support informed health care decisions by the Australian community. The conclusion is based on the findings of a rigorous assessment of more than 1800 papers. Of these, 225 studies met the criteria to be included in NHMRC's examination of the effectiveness of homeopathy. The review found no good quality, well-designed studies with enough participants to support the idea that homeopathy works better than a placebo, or causes health improvements equal to those of another treatment. Although some studies did report that homeopathy was effective, the quality of those studies was assessed as being small and/or of poor quality. These studies had either too few participants, poor design, poor conduct and or reporting to allow reliable conclusions to be drawn on the effectiveness of homeopathy. According to CEO Professor Warwick Anderson, "All medical treatments and interventions should be underpinned by reliable evidence. NHMRC's review shows that there is no good quality evidence to support the claim that homeopathy works better than a placebo." "People who choose homeopathy may put their health at risk if they reject or delay treatments for which there is good evidence for safety and effectiveness. People who are considering whether to use homeopathy should first get advice from a registered health practitioner and in the meanwhile keep taking any prescribed treatments." He emphasised that health practitioners should always offer treatments and therapies based on the best available evidence. "Each year NHMRC funds research to test treatments and procedures offered to patients, with more than $320 million spent on clinical and health services research in 2014," Professor Anderson said. "NHMRC conducts reviews of evidence on a range of health topics which is developed into guidelines or advice. Examples include clinical practice guidelines on the management of overweight and obesity and the Australian Dietary Guidelines," he said. making decisions about their health care." "From this review, the main recommendation for Australians is that they should not rely on homeopathy as a substitute for proven, effective treatments." "This statement was the result of a rigorous examination of the evidence and used internationally accepted methods for assessing the quality and reliability of evidence for determining whether or not a therapy is effective for treating health conditions." "NHMRC is also aware of strongly held views on this topic so it is important to note that the process was thoroughly consultative and that the public was invited to submit information and evidence, all of which was considered by our expert working committee." The findings of the homeopathy working group's review are summarised in the final NHMRC Information Paper: Evidence on the effectiveness of homeopathy for treating a clinical condition also released today. Its release follows public consultation on the draft information paper in 2014. One thing that did happen during February was an appearance in court for Fran Sheffield and Homeopathy Plus!. I was there on February 4 to hear the good news about how much the loss was going to cost the homeopath (a fine plus the other side's court costs) but in the normal manner of these things it was all put off until later. Both sides have to submit more information to the Court and the next scheduled appearance is April 22. You can see the order by clicking on the image. Here is a story from the BBC. I can't comment on it because I am laughing too much. A biologist? Stefan Lanka, who believes the illness is psychosomatic, made the pledge four years ago on his website. The reward was later claimed by German doctor David Barden, who gathered evidence from various medical studies. Mr Lanka dismissed the findings. But the court in the town of Ravensburg ruled that the proof was sufficient. Reacting to the verdict by the court in the southern town, Mr Lanka said he would appeal. "It is a psychosomatic illness," he told regional paper Suedkurier. "People become ill after traumatic separations." A recent outbreak of measles in Germany has sparked a debate about whether vaccinations against the disease should be compulsory. An 18-month-old boy in Berlin died last month of the disease. The World Health Organization said it was "taken aback" by the 22,000 cases reported across Europe since 2014, urging to step up vaccinations. Measles is a highly contagious infectious disease characterised by a high fever, a rash and generally feeling unwell. The most severe cases can be fatal.